VOC-compatible Coating – with significantly reduced solvent consumption. 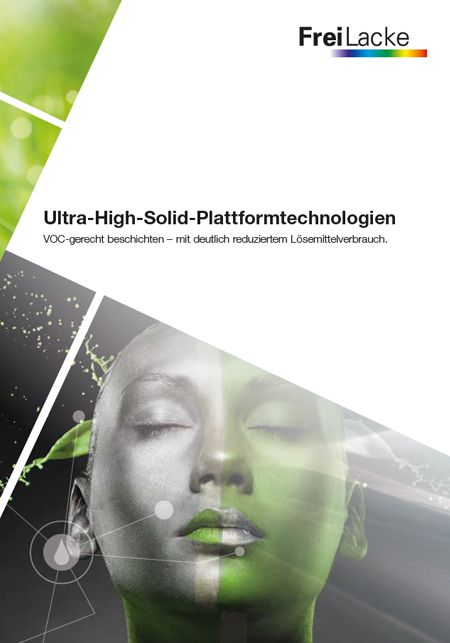 The steadily growing requirements placed on surface coatings and the continuous reduction of the total VOC content in paints and coatings led FreiLacke to develop Ultra-High-Solid systems or UHS for short. In the field of conventional coatings, completely new coating systems with a solids content of up to 80 percent by weight and a VOC value < 350 g/l were developed and brought to series-production readiness for this purpose. The new UHS systems also include two primers and a high-gloss top coat. As a classic 2C polyurethane primer, UR1937H can be used wherever rapid recoatability with a variety of top coat systems is required. UR1937H stands out thanks to its high stability and fast drying. Despite its high solids content of approx. 80 percent by weight, application by means of conventional air atomisation or air-assisted processes meets today’s requirements. The advantages of UR1937H in combination with the likewise recently developed UHS top coat UR1409G include excellent corrosion protection and a smooth surface. Adhesive strength is high, irrespective of whether the Substrate is untreated or pretreated. The need for only one curing agent for both the primer and top coat offers users easy handling and saves both time and money. The recently developed 2C epoxy UHS primer ER1936H can be used for applications with high corrosion protection requirements. Particular attention was paid to the choice of raw materials during the development of this epoxy primer. By using renewable raw materials, it was possible to formulate curing agent HE0016 in such a way that the irritation caused by amine hardeners could be significantly reduced. What is especially noteworthy is that both ER1936H and curing agent HE0016 were brought into series production without the use of any reactive thinners. Application and performance properties are in line with the state of the art. As well as rapid recoatability, the user can enjoy other Benefits such as high stability and a sufficiently long pot life. The new 2C polyurethane UHS top coat UR1409G is a highgloss top coat system that boasts excellent flow properties and rapid drying. As the matching top coat system for UHS primers UR1937H and ER1936H, this structure offers the solution to a wide variety of requirements in many areas: reduction of emissions, short cycle times and balanced application and surface properties.